Good: Strong art work, focused checklist, serial numbering ensures long-term collectibility. Bad: No text, limited appeal to collectors who aren't fans of set's subject. The Bottom Line: Like the two previous waves in the line, 2012 Rittenhouse Legends of Marvel: Series 3 is a character-centric release. Focusing exclusively on the Hulk, Storm and Moon Knight, the small factory set packs a lot of great artwork in a variety of styles. The set's major flaw is that despite its character focus, there is no biographical information for any of the characters. Although such a release is aimed at big-time Marvel fans, the lack of writing may not offer enough context for casual fans and collectors. That said, the cards are high-quality and nice to look at. 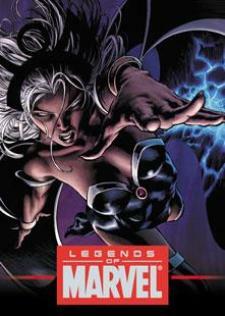 2012 Rittenhouse Legends of Marvel: Series 3 focuses on artwork. Both sides of the cards have a large image of the highlighted character. Although there is some repetition in the artists, there is still a nice mix of styles. The final card for each character has a matching serial number out of 1939, which commemorates the year Marvel debuted. With so much artwork, there's no text on the card outside of the copyright notices and artist credits. Although it's an overlooked part of cards, writing, even if it's limited, offers context. With nine spots to choose from, I would have appreciated even if one card back was dedicated to essential info like origins, first appearance and affiliations. The glossy card stock feels a little thicker than most Rittenhouse sets, adding a more premium feel to the cards. The foil Legends of Marvel logo on the front is very tastefully done. I like the idea behind mixing an A-list character like the Hulk with secondary characters. Although Storm is one of the more popular X-Men, she's still not on the same level of notoriety as the green behemoth. 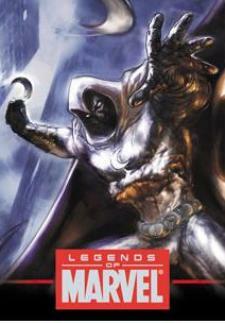 Moon Knight, well, let's call him more of a fan favorite. This method of release ensures the long-term viability of the Marvel Legends as all the main characters aren't used up right away. Some may say that 2012 Rittenhouse Legends of Marvel: Series 3 is priced too high given its small size and lack of chase cards. In some ways it is, especially when you place it along other base sets that are double or triple in size and moving at ten percent of the price. However, the limited nature and serial numbering should make sure that value holds over the long-term. 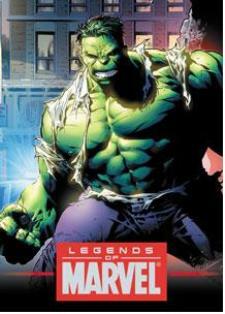 For comic fans, 2012 Rittenhouse Legends of Marvel: Series 3 offers a trove of awesome artwork to pour over and admire. But being a factory set of just 27 total cards, there's only so much pouring over one can do. The lack of text also prevents the line from really digging deep into the characters' background. Most likely to appeal to big-time Marvel maniacs, the card quality is among the best in comic-themed cards, reminiscent of the original Flair Marvel Masterpiece lines of the early 1990s. The Marvel Universe is vast. Rittenhouse continues highlighting the major players with Legends of Marvel: Series 3. As with the previous two installments, Series 3 focuses on three characters. This time it's the Hulk, Storm of X-Men fame and Moon Knight. Each character has nine cards, displaying a variety of artistic styles. Sold only in set form, the cards are numbered to 1939, commemorating the year Marvel Comics began. Collectors who bought earlier sets get the same serial number. Those just jumping in reserve that serial number for future releases in the line. The 27-card Legends of Marvel: Series 3 set comes with nine cards for each of the Hulk, Storm and Moon Knight. Cards are numbered to 1939 in honor of Marvel's first year. Collectors who ordered previous sets will get matching serial numbers as well as reserve that slot for future sets. A previously produced album is available and is intended for all the releases, past and future.